Insights on the changing business ecosystem and the future of work. 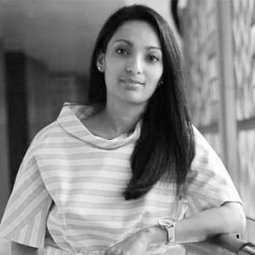 Ranjani Kearsley is the Head of HR for Fidelity International and leads a group of HR professionals across a global footprint spanning 24 countries. She studied Economics and Management at the London School of Economics (LSE) and went ahead to choose a career in HR owing to her fascination with human behaviour and decision making. Her first job was at an investment bank, where she developed a first-hand appreciation of what made certain teams successful and the cardinal role that a good leader plays in motivating and developing his team. In this exclusive conversation, Ranjani gives insights on the changing business ecosystem where no amount of prediction and scenario planning can truly prepare leaders for what is around the corner. She suggests that leaders should equip themselves with real-time subject matter expertise, look behind facts and figures to the insights and the stories, and create an environment of trust within their teams. She adds that HR plays an instrumental role in helping leaders to enable all of this — especially trust, which is the hardest to create. You studied Economics from the London School of Economics (LSE) and instead of choosing a career in Economics; you decided to work directly ‘with people’. What made you want to work with people? Was there any particular incident that triggered this? I got into art school and had my heart set on being a graphic designer but I was equally interested in the financial markets and so I chose to do my degree in economics and management. Although much of conventional economics relies on the assumption that people are rational, they are anything but! I find human behaviour and decision making fascinating and this in turn has led to a career in HR. My background in both economics and in art continues to help — all leaders, including those in HR need to take a holistic view of micro and macro relationships between individuals, markets and the broader economy, so that they can make informed decisions to fuel business growth. HR continues to be a fast growing field and it is great to see our ranks being bolstered by ever more diverse disciplines. Your first HR job was at an investment bank. Did this first stint at HR give you an early introduction to the value of strong leadership in inspiring and developing people? If so how? As my first foray into the world of work, I was lucky to be a part of an international graduate scheme at a global investment bank. It was a multidisciplinary program and gave me fantastic exposure to different parts of the business, cultures around the world and several HR domains. Across this spectrum, I developed a first-hand appreciation of why some teams were so successful and the part that good leaders can play in motivating and developing them. Some of my early role models were not only good people managers, but leaders who had a good balance of empathy and razor-sharp focus on the bottom line. The business ecosystem is constantly evolving in terms of changing customer expectations, regulatory pressures and global growth fears. How do you think leadership teams, with the support of HR, can overcome such challenges? Even as we find ourselves in a new age of predictive and prescriptive analytics, no amount of prediction or scenario planning can truly prepare leaders for what’s around the corner. Their landscape is increasingly complex with too many global and value-chain interdependencies. There is no silver bullet here, but I would encourage leaders to think about their ecosystem and what is within their zone of influence, arm themselves with real-time subject matter expertise, look behind facts and figures to the insights and the stories, and create an environment of trust within their teams. HR plays a part in helping to enable all of this, of which the last is the hardest to create. There are very few true ‘Eureka!’ moments nowadays for leaders where they come up with the perfect solution as if by magic or divine providence. You might get lucky once or twice in your career, but consistently successful leaders in my opinion are patient and tenacious. They make iterative, agile decisions and then ‘course-correct’ as needed. Not as simple as it sounds but I think it’s like muscle memory and gets more ingrained with practice. In the cold light of day, if some of your decisions don’t work out the way you intended them to, then it takes leadership teams with humility and resilience to acknowledge this, seek feedback and move on. There is a lot of noise about digital disruption. What kind of impact will the transition of organizations from traditional to going digital have on Human Resources? Are there any challenges or developments you’re observing in your organization owing to this transition? I’m over the word ‘disruption’. It seems to suggest that something static is being bombarded by a one-off cataclysmic event, whereas what we are experiencing is not a finite event. I think it’s fairer to say that digital evolution (some call it Darwinism) is our current reality and organizations need to constantly adapt to what’s next, and if they are really smart, leapfrog it. The impact of this evolution is less about adoption of emerging technologies — tech developments can become rapidly obsolete — and more about anticipating how behaviours will shift. The more profound impact is how this evolution is shaping employee and customer behaviours and expectations. HR has come a long way in its own ‘digitization’ from the days when I started out as a generalist. We now have design thinkers and UX specialists involved in our people practices and are incorporating wearable tech and virtual reality into our recruitment processes. We are issuing the robots in our processes with corporate IDs and including them on structure and governance charts! When we were building our capabilities on various HR systems across the company, having integrated platforms on the Cloud wasn't just a nice to have but absolutely non-negotiable! However, this brave new world might continue to transform. I don't agree with many AI evangelists that the HR function itself will die out only to be replaced by machine learning and algorithms. HR professionals will need to adapt and draw both inspiration and insight from different sources. Knowledge as a staple HR commodity is being redefined and we could do a lot to make HR processes and advice more intuitive and accessible by using technology effectively. Whatever the role of HR might look like in 20 years, human beings are beautiful, flawed and fragile creatures — and it takes one to know one! So I don't think we will ever take the human out of Human Resources. How can leaders be instrumental in managing the impact of future of work? What are some best practices at Fidelity around identifying and developing future leadership pipeline? I often hear parents debating what their children should learn at universities. What will secure them that first job and a successful career thereafter? Nowadays, no matter what discipline they choose (and one would hope they follow their passions! ), the future of work won’t be shaped just by technical skills but by life skills. The ability to collaborate, connect, establish trust, communicate credibly, all of these social and emotional skills are important as is innate curiosity and learning orientation. If you accept that robotics will hollow out the middle workforce by as much as 40 percent over the next few decades (with roles from typists to commercial pilots on the list identified for obsolescence), the future workforce will need to constantly adapt and reinvent itself. Leaders can create the right environment to foster this learning culture and ensure alignment to a common vision, so that even as the workforce is adapting, it is still headed in the right direction. At Fidelity, we want our leaders to not only have domain mastery but also real 'breadth'. A versatile mix of technical and experiential learning translates to leaders who can succeed in vastly different situations and cope with the shifting leadership demands of today. Women are underrepresented at the executive level or in leadership positions. What are your thoughts on this? How is the future of work going to impact women in leadership? Sadly, women are still woefully underrepresented in senior positions. I applaud and respect women who make a conscious choice to exit the workforce and focus on their families, but many who do return to work can find it difficult to get back on the right career trajectory. As a working parent with two young children, I know well the demands of juggling all aspects of your life. I've been lucky and have never faced overt discrimination or biases that have been an impediment to my development. However, one doesn't need to look far to see more subtle, unconscious biases manifesting themselves. Innocuous questions from well-meaning people like 'Your daughter is only 7 months old, and you've gone back to work. How does your husband feel about that?' can really cut deep. Even leaders who consider themselves progressive and inclusive may have hidden biases. But most business environments now recognize that there is a proven link between diverse teams and the impact on business profitability, and the way to deal with these unconscious biases is to increase awareness and acknowledge them. But being inclusive isn't just a business imperative but (to my mind) a moral imperative. It is good for business but also a fundamentally good thing to do. At Fidelity we see inclusion as the activity and diversity as the outcome. We do set targets and track our progress towards them, but we also focus on the endeavour to create inclusive environments that can hopefully give equal access and opportunities to all and embrace diversity in all its forms. We run a number of initiatives which try to increase access for people from underrepresented parts of the workforce who can find it difficult to get a way in (be it women, people from different social classes, or those returning to work after career breaks). As far as the future of work is concerned, I sincerely hope that one day we all move away from labels and stereotypes and see each individual as unique in their own right, rather than belonging to a 'group'. Do you have some key guidance and advice you would like to give to the CEOs and CHROs on developing Digital Leaders? Today, you are either a digital native yourself or leading other digital natives. Understand the shifts (be they behavioural, economic or social) that are taking place in this evolving landscape — chances are, your employees and customers are being profoundly impacted by these on a daily basis. Immersing yourself in the digital world would be great, but if you can't connect with your inner-geek, at least develop a level of appreciation and literacy in the new digital 'lingua franca' of this age. If 'bots' make you think of Doctor Who, then you might want to grab the nearest person under 25 and ask for some urgent mentoring. Digital leaders are fairly easy to spot — they are hungry for the new and the next, willing to experiment, not easily seduced by technology itself but look beyond it to what it can enable. The 'hero' narrative is struggling, and the power of many eclipses is the power of the one — this is also true of leadership, and digital leaders are natural collaborators who recognize how to harness the voice of the crowd. Develop these talented individuals through experiential and stretch assignments, move away from linear career-paths, curate inter-disciplinary influences, and keep an open mind about the world as they see it. You may not always see the possibilities they see, but embrace the vision — after all, as Arthur C Clarke put it, 'any sufficiently advanced technology is indistinguishable from magic'. Please note the article was originally published in the People Matters on 20 August 2017.